Our exclusive custom Nautical Memory Chart™ authenticates your loved one’s Sea Burial location. Families tell us that it makes an ideal voyage remembrance gift for those who participated in your sea burial event or as a memento for those who could not attend. The detailed chart shows the exact region, latitude, longitude, date and depth to document the sea burial and is helpful for future anniversary cruises to the same exact location. (Not to be used solely for navigation). 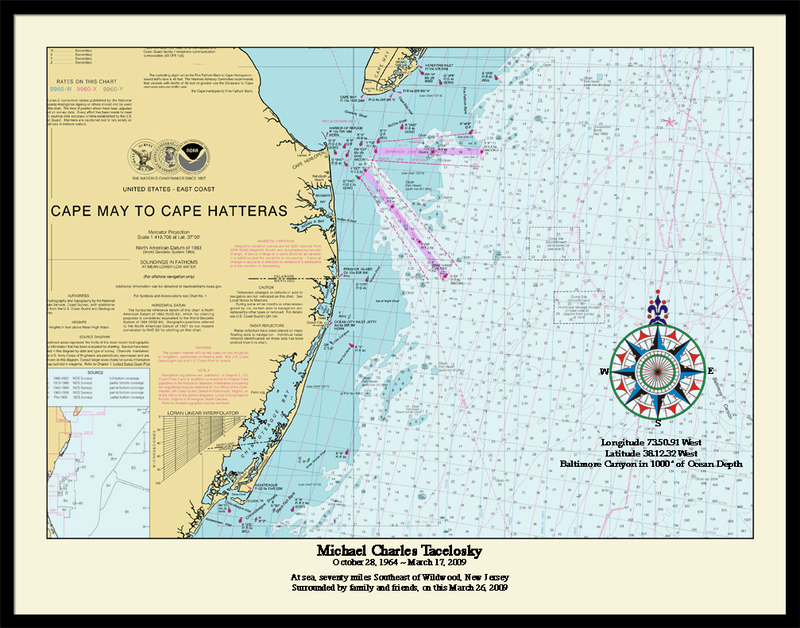 Conveniently sized at 11”x14” for easy framing, this official NOAA nautical chart shows the exact sea burial committal area location with or without your loved one’s photograph in the center of the compass rose or inlayed as a vignette. 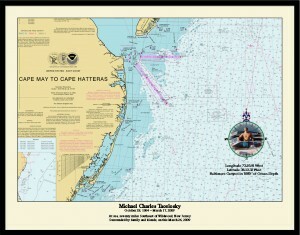 The chart scale will be the highest scale available dictated by the location. 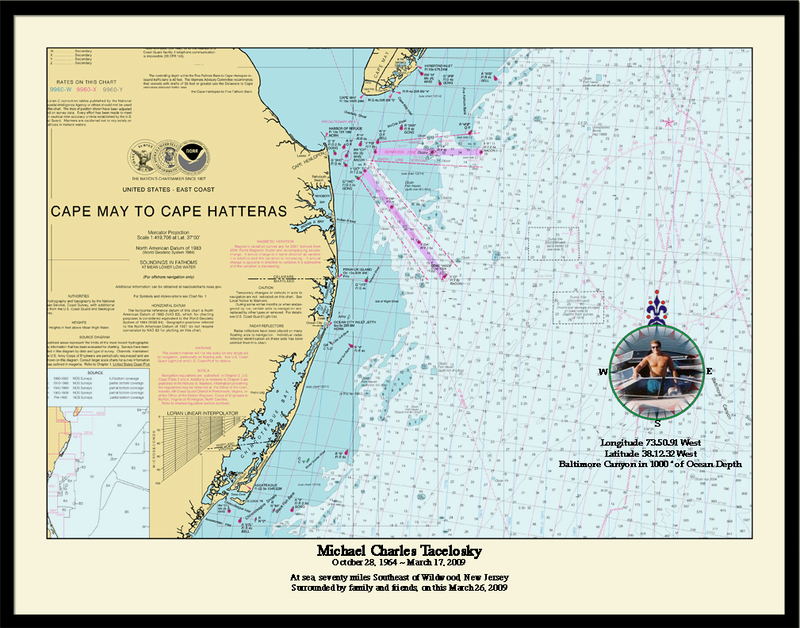 Particulars about our Customization Process: The Nautical Memory Chart™ is individually researched, designed and printed by our own Master Printer and Cartographer Alan James Robinson, The Map Guy in western Massachusetts. Alan has partnered with the United States Geological Survey (U.S.G.S. ), is a supplier for N.O.A.A. (National Oceanic and Atmospheric Administration) and has a Masters of Fine Art. Your museum quality print arrives suitable for framing for home library or office presentation. Please allow two weeks for detailed customization with standard delivery. Nautical Memory Charts can be pre-ordered during service planning or ordered later from our Ship’s Locker. Please allow two weeks for processing, detailed customization with standard delivery. Ships via USPS or UPS. Rush service is available.